Goa Lawah is a natural cave inhabited by bats. This cave has a lot of bats living without fear settled by humans. 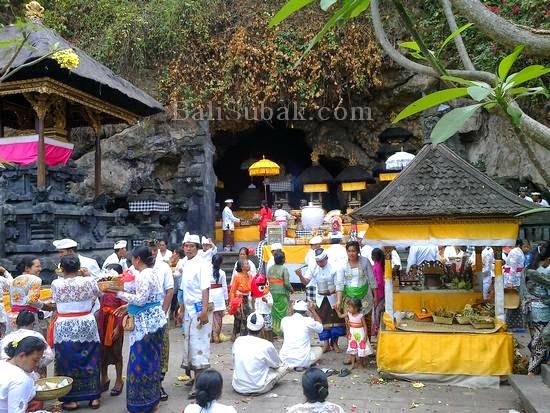 This cave was sanctified by the people of Bali. 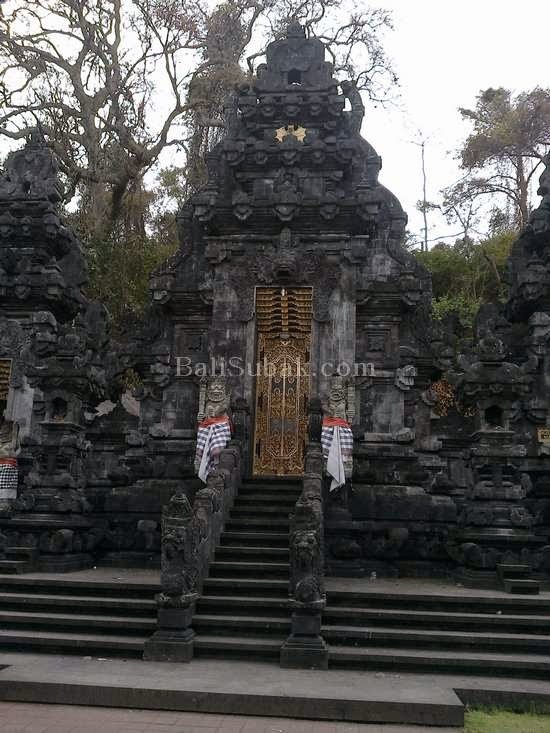 Pura Goa Lawah also be a place to pray by the majority of Hindus in Bali. 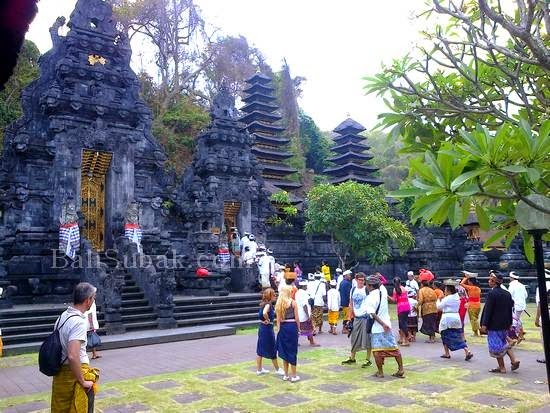 Pura Goa Lawah very well known by the people of Bali as a temple for purification of ancestral spirits. 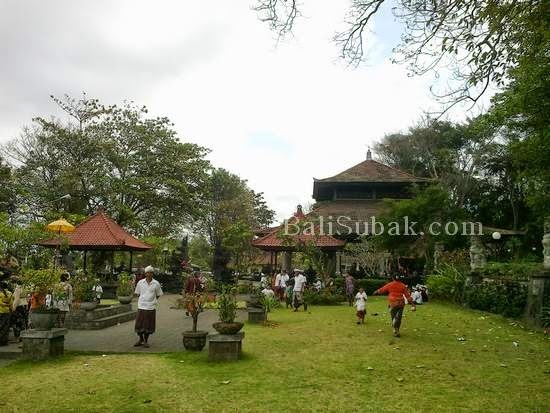 Usually, after Ngaben ceremony (cremation), will continue to this temple. 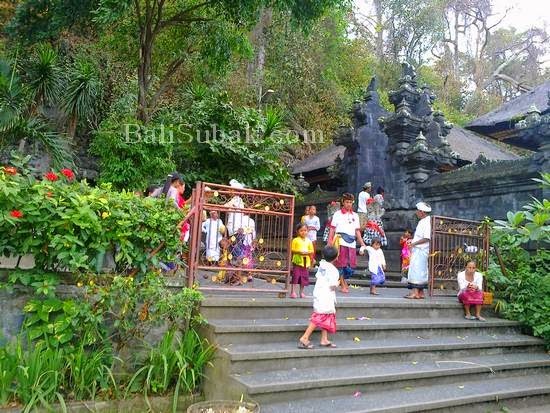 At certain moments, the temple is very much visited by both Hindus in Bali. This temple is located on the seafront, between the beach by taking only separated by a highway. Pura Goa Lawah located in Klungkung regency. It is easy to find, because it is in the lane that connects Denpasar to Padang Bay harbor. This temple is not a major tourist destination, attraction is just a stopover place. Because of its location on the tourist track, the temple is often visited by foreign tourists who happened to be passing in front of the temple. Residents around the temple are poor. They lived by selling and become a fisherman. Region around Goa Lawah very hot. 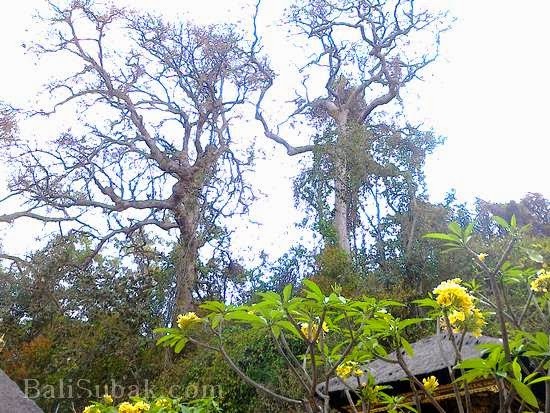 In the dry season, the area is very hot, most of the trees around the cave will wither and dry up. 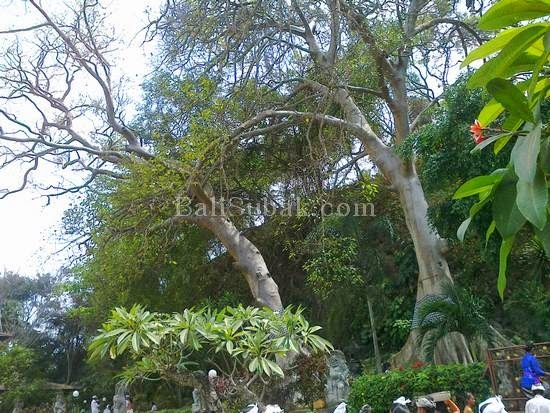 Just like in other temples in Bali, Goa Lawah temple also contained highly purified large tree. A large tree is the abode of ancestral spirits. Ancestral spirits lived in a large stone, in a large tree, on a mountain, in a cave. 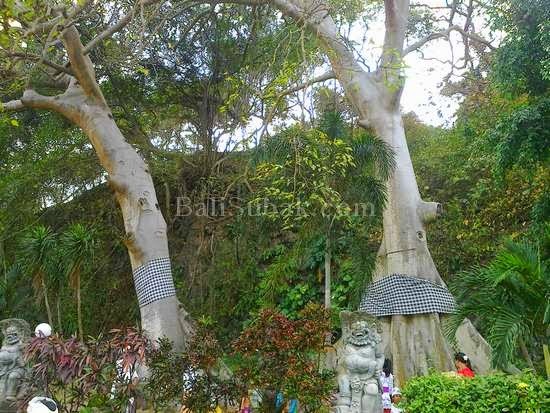 Therefore, almost all the temples and sacred places in Bali, has at least one large tree, as a residence ancestral spirits. In order not to disturb the ancestral spirits of human life. Upon entering the temple area, you can enjoy the architecture of the temple is very impressive. Entrance of temple architecture with distinctive features. The door is painted with gold color. The building is made ​​using stone from the volcano. The black color is characteristic of the use of this stone. Go deeper into the temple area, then you can see the cave inhabited by bats. 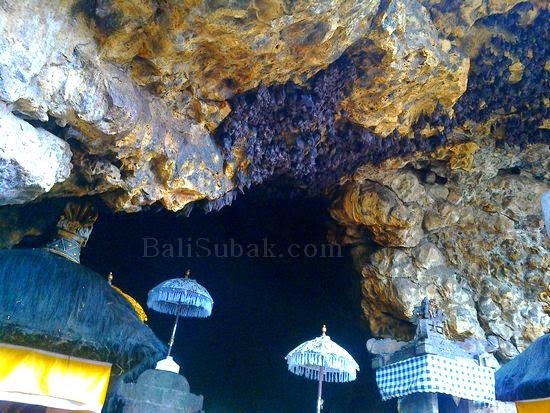 This cave was sanctified by the people of Bali. No one is allowed to enter the cave. 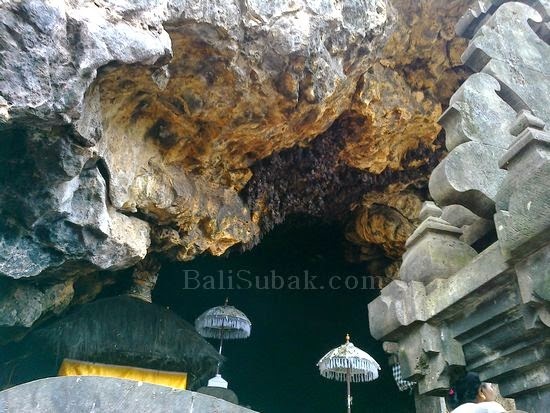 According to stories circulating in the community, this cave is very deep and penetrating elsewhere in Bali. 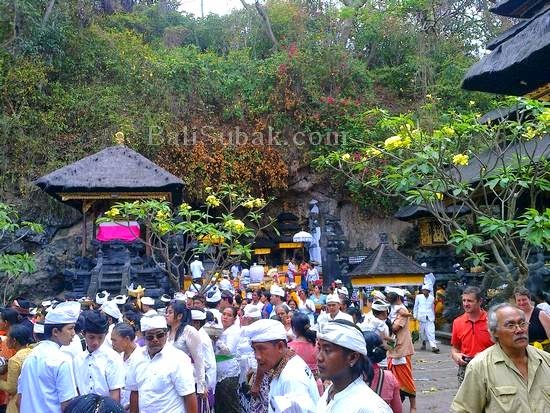 Certain moments, Pura Goa Lawah is visited by people of Bali to worship. If you are in this attraction when there are many people who are praying, chances are you will get in trouble with a closer look at the cave. Bats in the cave are not afraid of human existence. They are accustomed to human presence around. Noise of the bat is the hallmark of the temple. Bats in the cave will come out during the afternoon. They search for food at night, and again early in the morning. If you look carefully, in the temple area there are four large trees. This is the same tree as the tree in other temples around Bali. Balinese people call tree with PohonKepuh. Two trees were above the cave, two located on the west cave.